How It’s New York: Julie Feeney is electic and original, like this great city. How It’s Irish: Julie is an Irish girl, and her work has Irish magic in it. 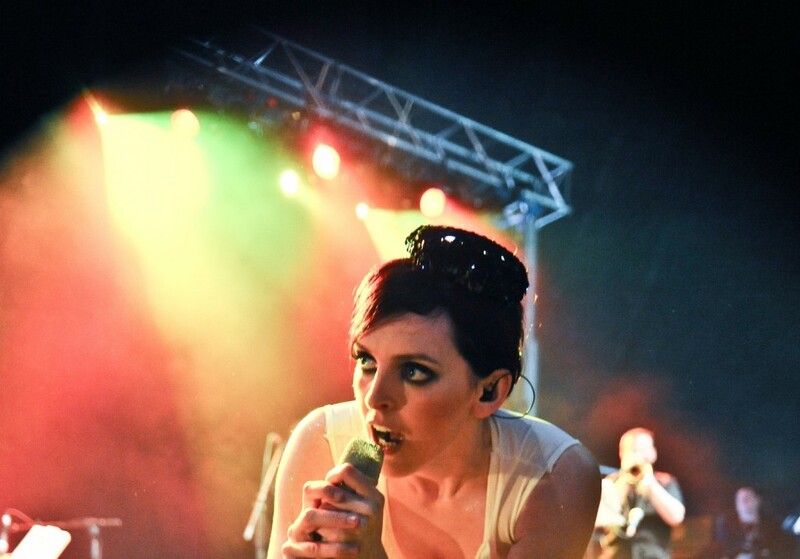 Irish songstress Julie Feeney performs tonight at Highline Ballroom. Here’s our review of her show last spring at Irish Arts Center. We eagerly await a new CD from Julie: stay tuned! You can listen to Julie on this podcast from 2011. This review of her show first appeared in Irish Examiner USA. We never do find out why there’s a picture of R.J., on a sign that says “R.J. Smith Realty,” hanging downstage right on the Irish Arts Center’s \ small stage, for the Julie Feeney concert. Nor do we learn why there is a stuffed cat toy, or an upside down birdfeeder. It’s all part of the atmosphere of gentle whimsy that pervades the singer-performer’s stage show, directed by PS 122’s Vallejo Gantner and Feeney. That poetic, tug-at-the-heart-strings mood pervades her affecting performance. She plays many songs that will be on a new album to be released toward the end of this year, as well as material from her earlier recordings 13 songs and Pages. It’s not usual for a singer to credit a costume designer for her crystal collar (Joanne Hynes) and headdresses (tamaranewyork.com and Britt Medaglia), but Julie seems to love the unusual. She appears wearing a short black dress that looks like a mini judge’s robe, with her hair in a beehive decorated with crystals, and high silver sequined shoes. Midway through the show, she puts on an elaborate black wig with a bun and red sparkly flower, and changes into sparkly red shoes. But more strange than her highly theatrical costumes is the contrast with her very natural, almost shy, delivery. She talks to the audience between songs, telling stories of her inspiration that include how her Galway grandparents would wait for moonlit nights to cycle to a neighbor’s, in a sincere, direct tone. For me, the overall effect is that of a strange kind of shyness, of an artist so naked onstage that she needs glitter to clothe her. But it’s also playful, as are her interactions with the band. Julie’s melodies are often lyrical or catchy, with lyrics that reference Tolstoy, innocence and beauty. She’s scored her songs anew for this group, that includes David Baranowski on keyboards, Joseph Brent on guitar, Elizabeth Cary on violin, Mike Kuennen on bass, Jennifer Marshall on vocals and recorder, Laura Metcalf on cello, and Terry Szor on trumpet. Many of the band also sing harmonies. Oh, and that voice, that deep, yummy mezzo, that has a hint of jazz inflection in it. Julie sounds a little like Karen Carpenter, if Carpenter drank chartreuse at a French café. She bends it around poetic insights and casually graceful songlines, and sings with an earnest and precise intensity. She begins the show with “Myth,” rushing through the audience and whispering, demonstrating the power of gossip over truth. “Knock knock” is a gorgeous song, sung with close harmonies with Marshall and the others. For an encore, she sings it again, with harpist Cormac De Barra who supposedly was just hanging around in the lobby with his harp. The tenderness is as apparent in the music as in the rather complex words. “One more tune,” which, like “Knock knock,” is from Pages, shows off Julie’s creativity with arrangements. She uses her own handclaps and that of her band for percussion and sings with no instrumentation but that and the trumpet. Some of the songs took on a jazz complexity, while others used her ensemble in a chamber music, baroque style. We never do learn why R.J. is there, but by the end of the performance, his earnest, sincere expression looks beautiful. 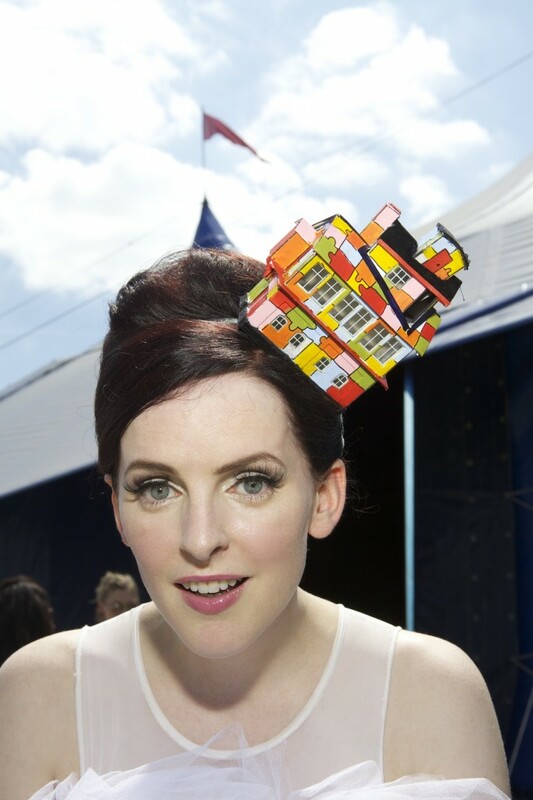 Julie Feeney touches everything around her with unexpected, lingering grace.